From the title you could probably guess today's post is about Mattey. She is totally a girly girl. Recently she's taken to doing her own nails. (I guess Meg won't do it for her anymore.) She's still learning to let them dry before doing anything else. Today she got a little colorful with her polish choices. Aww so cute! 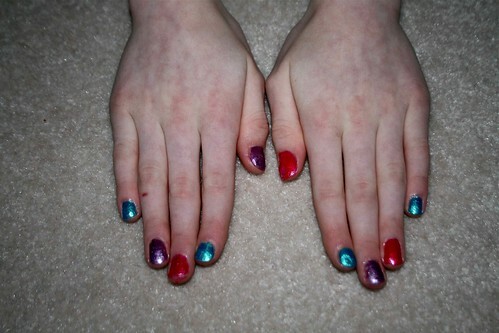 That is what the nails look like here too.